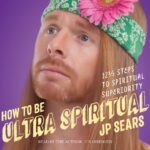 JP Sears is best known for his hit “Ultra Spiritual” comedy series, which has accumulated over 100 million YouTube views. He is also an emotional healing coach, and has numerous online videos through which he encourages healing and growth. He is also an author, international teacher, speaker at events, world traveler, and curious student of life. His work empowers people to live more meaningful lives. JP is the author of “How to Be Ultra Spiritual: 12 1/2 Steps to Spiritual Superiority ” (Sounds True Publishing, release date of March 7th, 2017. Also available as an audio book). You can learn more about JP and his work at AwakenWithJP.com and at his Ultra Spiritual website. This entry was posted in Creative Artists/Musicians, Guest, Psychologists/Therapists by Rick Archer. Bookmark the permalink.